ESPEI, or Extensible Self-optimizing Phase Equilibria Infrastructure, is a tool for automated thermodynamic database development within the CALPHAD method. The ESPEI package is based on a fork of pycalphad-fitting and uses pycalphad for calculating Gibbs free energies of thermodynamic models. The implementation for ESPEI involves first fitting single-phase data by calculating parameters in thermodynamic models that are linearly described by the single-phase input data. Then Markov Chain Monte Carlo (MCMC) is used to optimize the candidate models from the single-phase fitting to multi-phase zero-phase fraction data. Single-phase and multi-phase fitting methods are described in Chapter 3 of Richard Otis’s thesis. The benefit of this approach is the automated, simultaneous fitting for many parameters that yields uncertainty quantification, as shown in Otis and Liu High-Throughput Thermodynamic Modeling and Uncertainty Quantification for ICME. Jom 69, (2017). The name and idea of ESPEI are originally based off of Shang, Wang, and Liu, ESPEI: Extensible, Self-optimizing Phase Equilibrium Infrastructure for Magnesium Alloys Magnes. Technol. 2010 617-622 (2010). 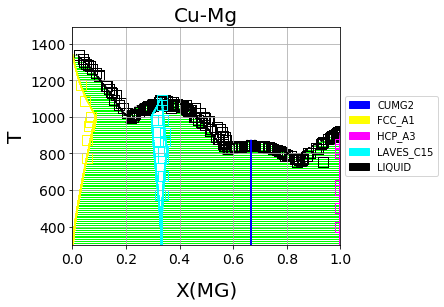 Cu-Mg phase diagram from a database created with and optimized by ESPEI. See the Cu-Mg Example. ESPEI has two different fitting modes: single-phase and multi-phase fitting. You can run either of these modes or both of them sequentially. To run either of the modes, you need to have a phase models file that describes the phases in the system using the standard CALPHAD approach within the compound energy formalism. You also need to describe the data that ESPEI should fit to. You will need single-phase and multi-phase data for a full run. Fit settings and all datasets are stored as JSON files and described in detail at the Gathering input data page. All of your input datasets should be validated by running espei --check-datasets my-input-datasets, where my-input-datasets is a folder of all your JSON files. The main output result is going to be a database (defaults to out.tdb), an array of the steps in the MCMC chain (defaults to chain.npy), and the an array of the log-probabilities for each iteration and chain (defaults to lnprob.npy). If you have only heat capacity, entropy and enthalpy data and mixing data (e.g. from first-principles), you may want to see the starting point for your MCMC calculation. Create an input file called espei-in.yaml. The TDB file you input must have all of the degrees of freedom you want as FUNCTIONs with names beginning with VV. ESPEI lets you control many aspects of your calculations with the input files shown above. See Writing ESPEI input for a full description of all possible inputs. A: Common mistakes are using single quotes instead of the double quotes required by JSON files. Another common source of errors is misaligned open/closing brackets. Many mistakes are found with ESPEI’s check-datasets utility. Run espei check-datasets my-input-datasets on your directory my-input-datasets. A: By default, ESPEI will create chain.npy and lnprob.npy for the MCMC chain at the end of your run and according to the save interval (defaults to every 20 iterations). These are created from arrays via numpy.save() and can thus be loaded with numpy.load(). Note that the arrays are preallocated with zeros. These filenames and settings can be changed using in the input file. You can then use these chains and corresponding log-probabilities to make corner plots, calculate autocorrelations, find optimal parameters for databases, etc.. Finally, you can use py:mod: espei.plot functions such as multiplot to plot phase diagrams with your input equilibria data and plot_parameters to compare single-phase data (e.g. formation and mixing data) with the properties calculated with your database. A: Yes! ESPEI has MPI support. To use ESPEI with MPI, you simply call ESPEI in the same way as above with mpirun or whichever MPI software you use. You also must indicate to ESPEI that it should create an MPI scheduler by setting the input option scheduler: MPIPool in the mcmc heading. Be aware that mpi4py must be compiled with an MPI-enabled compiler, see the mpi4py installation instructions. For help on installing and using ESPEI, please join the PhasesResearchLab/ESPEI Gitter room. Bugs and software issues should be reported on GitHub. paramselect.py is where all of the fitting happens. This is the core. core_utils.py contains specialized utilities for ESPEI. utils.py are utilities with reuse potential outside of ESPEI. ESPEI is MIT licensed. See LICENSE. © Copyright 2017, Richard Otis and Brandon Bocklund. Revision 1f6155bb.